Medical cannabis can be administered through various methods, including capsules, lozenges, tinctures, dermal patches, oral or dermal sprays, cannabis edibles, and vaporizing or smoking dried buds. Synthetic cannabinoids are available for prescription use in some countries, such as dronabinol and nabilone. 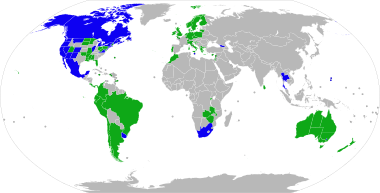 Countries that allow the medical use of whole-plant cannabis include Australia, Canada, Chile, Colombia, Germany, Greece, Israel, Italy, the Netherlands, Peru, Poland, Portugal, and Uruguay. In the United States, 33 states and the District of Columbia have legalized cannabis for medical purposes, beginning with the passage of California's Proposition 215 in 1996. Although cannabis remains prohibited for any use at the federal level, the Rohrabacher–Farr amendment was enacted in December 2014, limiting the ability of federal law to be enforced in states where medical cannabis has been legalized. A 2014 review stated that the variations in ratio of CBD-to-THC in botanical and pharmaceutical preparations determines the therapeutic vs psychoactive effects (CBD attenuates THC's psychoactive effects) of cannabis products. A 2016 Cochrane review said that cannabinoids were "probably effective" in treating chemotherapy-induced nausea in children, but with a high side-effect profile (mainly drowsiness, dizziness, altered moods, and increased appetite). Less common side effects were "ocular problems, orthostatic hypotension, muscle twitching, pruritis, vagueness, hallucinations, lightheadedness and dry mouth". Cannabis' efficacy is not clear in treating neurological problems, including multiple sclerosis (MS), epilepsy, and movement problems. The combination of Δ9-tetrahydrocannabinol (THC) and cannabidiol (CBD) extracts give subjective relief of spasticity, though objective post-treatment assessments do not reveal significant changes. Evidence also suggests that oral cannabis extract is effective for reducing patient-centered measures of spasticity. A trial of cannabis is deemed to be a reasonable option if other treatments have not been effective. [by whom?] Its use for MS is approved in ten countries. [conflicted source?] A 2012 review found no problems with tolerance, abuse, or addiction. A 2013 literature review found that exposure to marijuana had biologically-based physical, mental, behavioral and social health consequences and was "associated with diseases of the liver (particularly with co-existing hepatitis C), lungs, heart, and vasculature". A 2007 meta analysis concluded that cannabis use reduced the average age of onset of psychosis by 2.7 years relative to non-cannabis use. A 2005 meta analysis concluded that adolescent use of cannabis increases the risk of psychosis, and that the risk is dose-related. A 2004 literature review on the subject concluded that cannabis use is associated with a two-fold increase in the risk of psychosis, but that cannabis use is "neither necessary nor sufficient" to cause psychosis. A French review from 2009 came to a conclusion that cannabis use, particularly that before age 15, was a factor in the development of schizophrenic disorders. Smoking has been the means of administration of cannabis for many users, but it is not suitable for the use of cannabis as a medicine. It was the most common method of medical cannabis consumption in the US as of 2013[update]. It is difficult to predict the pharmacological response to cannabis because concentration of cannabinoids varies widely, as there are different ways of preparing it for consumption (smoked, applied as oils, eaten, infused into other foods, or drunk) and a lack of production controls. The potential for adverse effects from smoke inhalation makes smoking a less viable option than oral preparations. Cannabis vaporizers have gained popularity because of the perception among users that fewer harmful chemicals are ingested when components are inhaled via aerosol rather than smoke. Cannabinoid medicines are available in pill form (dronabinol and nabilone) and liquid extracts formulated into an oromucosal spray (nabiximols). Oral preparations are "problematic due to the uptake of cannabinoids into fatty tissue, from which they are released slowly, and the significant first-pass liver metabolism, which breaks down Δ9THC and contributes further to the variability of plasma concentrations". The US Food and Drug Administration (FDA) has not approved smoked cannabis for any condition or disease, as it deems that evidence is lacking concerning safety and efficacy. The FDA issued a 2006 advisory against smoked medical cannabis stating: "marijuana has a high potential for abuse, has no currently accepted medical use in treatment in the United States, and has a lack of accepted safety for use under medical supervision." Cannabis, called má 麻 (meaning "hemp; cannabis; numbness") or dàmá 大麻 (with "big; great") in Chinese, was used in Taiwan for fiber starting about 10,000 years ago. The botanist Hui-lin Li wrote that in China, "The use of Cannabis in medicine was probably a very early development. Since ancient humans used hemp seed as food, it was quite natural for them to also discover the medicinal properties of the plant." Emperor Shen-Nung, who was also a pharmacologist, wrote a book on treatment methods in 2737 BCE that included the medical benefits of cannabis. He recommended the substance for many ailments, including constipation, gout, rheumatism, and absent-mindedness. Cannabis is one of the 50 "fundamental" herbs in traditional Chinese medicine. Surviving texts from ancient India confirm that cannabis' psychoactive properties were recognized, and doctors used it for treating a variety of illnesses and ailments, including insomnia, headaches, gastrointestinal disorders, and pain, including during childbirth. Widely cultivated strains of cannabis, such as "Afghani" or "Hindu Kush", are indigenous to the Pakistan and Afghanistan regions, while "Durban Poison" is native to Africa. :45–48 There are approximately 16 landrace strains of cannabis identified from Pakistan, Jamaica, Africa, Mexico, Central America and Asia. An Irish physician, William Brooke O'Shaughnessy, is credited with introducing cannabis to Western medicine. O'Shaughnessy discovered cannabis in the 1830s while living abroad in India, where he conducted numerous experiments investigating its medical utility. Noting in particular its analgesic and anticonvulsant effects, O'Shaughnessy returned to England with a supply of cannabis in 1842, after which its use spread through Europe and the United States. Cannabis was entered into the United States Pharmacopeia in 1850. In the United States, health insurance companies may not pay for a medical marijuana prescription as the Food and Drug Administration must approve any substance for medicinal purposes. Before this can happen, the FDA must first permit the study of the medical benefits and drawbacks of the substance, which it has not done since it was placed on Schedule I of the Controlled Substances Act in 1970. Therefore, all expenses incurred fulfilling a medical marijuana prescription will possibly be incurred as out-of-pocket. However, the New Mexico Court of Appeals has ruled that workers' compensation insurance must pay for prescribed marijuana as part of the state's Medical Cannabis Program. 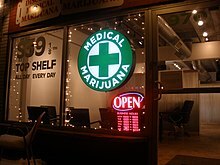 The authors of a report on a 2011 survey of medical cannabis users say that critics have suggested that some users "game the system" to obtain medical cannabis ostensibly for treatment of a condition, but then use it for nonmedical purposes – though the truth of this claim is hard to measure. The report authors suggested rather that medical cannabis users occupied a "continuum" between medical and nonmedical use. Nabiximols is used for treatment of spasticity associated with MS when other therapies have not worked, and when an initial trial demonstrates "meaningful improvement". Trials for FDA approval in the US are underway. It is also approved in several European countries for overactive bladder and vomiting. When sold under the trade name Sativex as a mouth spray, the prescribed daily dose in Sweden delivers a maximum of 32.4 mg of THC and 30 mg of CBD; mild to moderate dizziness is common during the first few weeks. In 1964, Albert Lockhart and Manley West began studying the health effects of traditional cannabis use in Jamaican communities. They developed, and in 1987 gained permission to market, the pharmaceutical "Canasol", one of the first cannabis extracts. ^ "Release the strains". Nature Medicine. 21 (9): 963. September 2015. doi:10.1038/nm.3946. PMID 26340110. ^ a b c d e f g h i j k l m n o p q r s t u v w x Borgelt LM, Franson KL, Nussbaum AM, Wang GS (February 2013). "The pharmacologic and clinical effects of medical cannabis" (PDF). Pharmacotherapy. 33 (2): 195–209. doi:10.1002/phar.1187. PMID 23386598. ^ a b c d e f g Whiting PF, Wolff RF, Deshpande S, Di Nisio M, Duffy S, Hernandez AV, Keurentjes JC, Lang S, Misso K, Ryder S, Schmidlkofer S, Westwood M, Kleijnen J (23 June 2015). "Cannabinoids for Medical Use: A Systematic Review and Meta-analysis". JAMA. 313 (24): 2456–73. doi:10.1001/jama.2015.6358. PMID 26103030. ^ a b c d Ben Amar M (April 2006). "Cannabinoids in medicine: A review of their therapeutic potential". Journal of Ethnopharmacology (Review). 105 (1–2): 1–25. CiteSeerX 10.1.1.180.308. doi:10.1016/j.jep.2006.02.001. PMID 16540272. ^ a b Schubart CD, Sommer IE, Fusar-Poli P, de Witte L, Kahn RS, Boks MP (January 2014). "Cannabidiol as a potential treatment for psychosis" (PDF). European Neuropsychopharmacology. 24 (1): 51–64. doi:10.1016/j.euroneuro.2013.11.002. PMID 24309088. ^ a b c Koppel BS, Brust JC, Fife T, Bronstein J, Youssof S, Gronseth G, Gloss D (April 2014). "Systematic review: efficacy and safety of medical marijuana in selected neurologic disorders: report of the Guideline Development Subcommittee of the American Academy of Neurology". Neurology. 82 (17): 1556–63. doi:10.1212/WNL.0000000000000363. PMC 4011465. PMID 24778283. ^ a b Sachs J, McGlade E, Yurgelun-Todd D (October 2015). "Safety and Toxicology of Cannabinoids". Neurotherapeutics. 12 (4): 735–46. doi:10.1007/s13311-015-0380-8. PMC 4604177. PMID 26269228. ^ a b Grotenhermen F, Müller-Vahl K (July 2012). "The therapeutic potential of cannabis and cannabinoids". Deutsches Arzteblatt International. 109 (29–30): 495–501. doi:10.3238/arztebl.2012.0495. PMC 3442177. PMID 23008748. ^ Bowles DW, O'Bryant CL, Camidge DR, Jimeno A (July 2012). "The intersection between cannabis and cancer in the United States". Critical Reviews in Oncology/Hematology (Review). 83 (1): 1–10. doi:10.1016/j.critrevonc.2011.09.008. PMID 22019199. ^ a b Wang T, Collet JP, Shapiro S, Ware MA (June 2008). "Adverse effects of medical cannabinoids: a systematic review". CMAJ (Review). 178 (13): 1669–78. doi:10.1503/cmaj.071178. PMC 2413308. PMID 18559804. ^ Jordan K, Sippel C, Schmoll HJ (September 2007). "Guidelines for antiemetic treatment of chemotherapy-induced nausea and vomiting: past, present, and future recommendations". The Oncologist (Review). 12 (9): 1143–50. doi:10.1634/theoncologist.12-9-1143. PMID 17914084. ^ Nicolson SE, Denysenko L, Mulcare JL, Vito JP, Chabon B (May – June 2012). "Cannabinoid hyperemesis syndrome: a case series and review of previous reports". Psychosomatics (Review, case series). 53 (3): 212–9. doi:10.1016/j.psym.2012.01.003. PMID 22480624. ^ Phillips RS, Friend AJ, Gibson F, Houghton E, Gopaul S, Craig JV, Pizer B (February 2016). "Antiemetic medication for prevention and treatment of chemotherapy-induced nausea and vomiting in childhood". The Cochrane Database of Systematic Reviews. 2: CD007786. doi:10.1002/14651858.CD007786.pub3. PMID 26836199. ^ Lutge EE, Gray A, Siegfried N (April 2013). "The medical use of cannabis for reducing morbidity and mortality in patients with HIV/AIDS". The Cochrane Database of Systematic Reviews (Review). 4 (4): CD005175. doi:10.1002/14651858.CD005175.pub3. PMID 23633327. ^ Nugent SM, Morasco BJ, O'Neil ME, Freeman M, Low A, Kondo K, Elven C, Zakher B, Motu'apuaka M, Paynter R, Kansagara D (September 2017). "The Effects of Cannabis Among Adults With Chronic Pain and an Overview of General Harms: A Systematic Review". Annals of Internal Medicine. 167 (5): 319–331. doi:10.7326/M17-0155. PMID 28806817. ^ Andreae MH, Carter GM, Shaparin N, Suslov K, Ellis RJ, Ware MA, Abrams DI, Prasad H, Wilsey B, Indyk D, Johnson M, Sacks HS (December 2015). "Inhaled Cannabis for Chronic Neuropathic Pain: A Meta-analysis of Individual Patient Data". The Journal of Pain. 16 (12): 1221–1232. doi:10.1016/j.jpain.2015.07.009. PMC 4666747. PMID 26362106. ^ Lynch ME, Campbell F (November 2011). "Cannabinoids for treatment of chronic non-cancer pain; a systematic review of randomized trials". British Journal of Clinical Pharmacology (Review). 72 (5): 735–44. doi:10.1111/j.1365-2125.2011.03970.x. PMC 3243008. PMID 21426373. ^ Carter GT, Flanagan AM, Earleywine M, Abrams DI, Aggarwal SK, Grinspoon L (August 2011). "Cannabis in palliative medicine: improving care and reducing opioid-related morbidity". The American Journal of Hospice & Palliative Care (Review). 28 (5): 297–303. doi:10.1177/1049909111402318. PMID 21444324. ^ Lakhan SE, Rowland M (December 2009). "Whole plant cannabis extracts in the treatment of spasticity in multiple sclerosis: a systematic review". BMC Neurology (Review). 9: 59. doi:10.1186/1471-2377-9-59. PMC 2793241. PMID 19961570. ^ Clark PA, Capuzzi K, Fick C (December 2011). "Medical marijuana: medical necessity versus political agenda". Medical Science Monitor (Review). 17 (12): RA249–61. doi:10.12659/MSM.882116. PMC 3628147. PMID 22129912. ^ Gage SH, Hickman M, Zammit S (April 2016). "Association Between Cannabis and Psychosis: Epidemiologic Evidence". Biological Psychiatry. 79 (7): 549–56. doi:10.1016/j.biopsych.2015.08.001. PMID 26386480. ^ a b c Hall W, Solowij N (November 1998). "Adverse effects of cannabis". Lancet. 352 (9140): 1611–6. doi:10.1016/S0140-6736(98)05021-1. PMID 9843121. ^ a b Tashkin DP (June 2013). "Effects of marijuana smoking on the lung". Annals of the American Thoracic Society. 10 (3): 239–47. doi:10.1513/annalsats.201212-127fr. PMID 23802821. ^ Jones RT (November 2002). "Cardiovascular system effects of marijuana". Journal of Clinical Pharmacology (Review). 42 (S1): 58S–63S. doi:10.1002/j.1552-4604.2002.tb06004.x. PMID 12412837. ^ Crean RD, Crane NA, Mason BJ (March 2011). "An evidence based review of acute and long-term effects of cannabis use on executive cognitive functions". Journal of Addiction Medicine. 5 (1): 1–8. doi:10.1097/ADM.0b013e31820c23fa. PMC 3037578. PMID 21321675. ^ Martín-Santos R, Fagundo AB, Crippa JA, Atakan Z, Bhattacharyya S, Allen P, Fusar-Poli P, Borgwardt S, Seal M, Busatto GF, McGuire P (March 2010). "Neuroimaging in cannabis use: a systematic review of the literature" (PDF). Psychological Medicine. 40 (3): 383–98. doi:10.1017/S0033291709990729. PMID 19627647. ^ Grant I, Gonzalez R, Carey CL, Natarajan L, Wolfson T (July 2003). "Non-acute (residual) neurocognitive effects of cannabis use: a meta-analytic study". Journal of the International Neuropsychological Society. 9 (5): 679–89. doi:10.1017/S1355617703950016. PMID 12901774. Lay summary – WebMD (1 July 2003). ^ Arseneault L, Cannon M, Witton J, Murray RM (February 2004). "Causal association between cannabis and psychosis: examination of the evidence". The British Journal of Psychiatry. 184 (2): 110–7. doi:10.1192/bjp.184.2.110. PMID 14754822. ^ Jayanthi S, Buie S, Moore S, Herning RI, Better W, Wilson NM, Contoreggi C, Cadet JL (January 2010). "Heavy marijuana users show increased serum apolipoprotein C-III levels: evidence from proteomic analyses". Molecular Psychiatry. 15 (1): 101–12. doi:10.1038/mp.2008.50. PMC 2797551. PMID 18475272. Lay summary – Reuters (13 May 2008). ^ Downer EJ, Campbell VA (January 2010). "Phytocannabinoids, CNS cells and development: a dead issue?". Drug and Alcohol Review (Review). 29 (1): 91–8. doi:10.1111/j.1465-3362.2009.00102.x. PMID 20078688. ^ Burns TL, Ineck JR (February 2006). "Cannabinoid analgesia as a potential new therapeutic option in the treatment of chronic pain". The Annals of Pharmacotherapy (Review). 40 (2): 251–60. doi:10.1345/aph.1G217. PMID 16449552. ^ Mackie K (May 2008). "Cannabinoid receptors: where they are and what they do". Journal of Neuroendocrinology. 20 Suppl 1: 10–4. doi:10.1111/j.1365-2826.2008.01671.x. PMID 18426493. ^ Whiteside GT, Lee GP, Valenzano KJ (2007). "The role of the cannabinoid CB2 receptor in pain transmission and therapeutic potential of small molecule CB2 receptor agonists". Current Medicinal Chemistry. 14 (8): 917–36. doi:10.2174/092986707780363023. PMID 17430144. ^ a b c d e Gaston TE, Friedman D (May 2017). "Pharmacology of cannabinoids in the treatment of epilepsy". Epilepsy & Behavior. Cannabinoids and Epilepsy. 70 (Pt B): 313–318. doi:10.1016/j.yebeh.2016.11.016. PMID 28087250. ^ Mannila J, Järvinen T, Järvinen K, Tervonen J, Jarho P (March 2006). "Sublingual administration of Delta9-tetrahydrocannabinol/beta-cyclodextrin complex increases the bioavailability of Delta9-tetrahydrocannabinol in rabbits". Life Sciences. 78 (17): 1911–4. doi:10.1016/j.lfs.2005.08.025. PMID 16266727. ^ a b Badowski ME (September 2017). "A review of oral cannabinoids and medical marijuana for the treatment of chemotherapy-induced nausea and vomiting: a focus on pharmacokinetic variability and pharmacodynamics". Cancer Chemotherapy and Pharmacology. 80 (3): 441–449. doi:10.1007/s00280-017-3387-5. PMC 5573753. PMID 28780725. ^ Nahas GG (April 2001). "The pharmacokinetics of THC in fat and brain: resulting functional responses to marihuana smoking". Human Psychopharmacology. 16 (3): 247–255. doi:10.1002/hup.258. PMID 12404577. ^ a b Devinsky O, Cilio MR, Cross H, Fernandez-Ruiz J, French J, Hill C, Katz R, Di Marzo V, Jutras-Aswad D, Notcutt WG, Martinez-Orgado J, Robson PJ, Rohrback BG, Thiele E, Whalley B, Friedman D (June 2014). "Cannabidiol: pharmacology and potential therapeutic role in epilepsy and other neuropsychiatric disorders". Epilepsia. 55 (6): 791–802. doi:10.1111/epi.12631. PMC 4707667. PMID 24854329. ^ Grotenhermen F (1 April 2003). "Pharmacokinetics and pharmacodynamics of cannabinoids". Clinical Pharmacokinetics. 42 (4): 327–60. doi:10.2165/00003088-200342040-00003. PMID 12648025. ^ Ohlsson A, Lindgren JE, Andersson S, Agurell S, Gillespie H, Hollister LE (February 1986). "Single-dose kinetics of deuterium-labelled cannabidiol in man after smoking and intravenous administration". Biomedical & Environmental Mass Spectrometry. 13 (2): 77–83. doi:10.1002/bms.1200130206. PMID 2937482. ^ [unreliable source?] "The Ebers Papyrus The Oldest (confirmed) Written Prescriptions For Medical Marihuana era 1,550 BC". onlinepot.org. Retrieved 10 June 2008. ^ Touw M (1981). "The religious and medicinal uses of Cannabis in China, India and Tibet". Journal of Psychoactive Drugs. 13 (1): 23–34. doi:10.1080/02791072.1981.10471447. PMID 7024492. ^ a b Butrica, James L. (2002). "The Medical Use of Cannabis Among the Greeks and Romans" (PDF). Journal of Cannabis Therapeutics. 2 (2): 51–70. doi:10.1300/J175v02n02_04. Retrieved 8 November 2014. ^ Lozano, Indalecio (2001). "The Therapeutic Use of Cannabis sativa (L.) in Arabic Medicine". Journal of Cannabis Therapeutics. 1: 63–70. CiteSeerX 10.1.1.550.1717. doi:10.1300/J175v01n01_05. ^ Pacula, Rosalie Piccardo (February 2002). "State Medical Marijuana Laws: Understanding the Laws and Their Limitations" (PDF). Journal of Public Health Policy. 23 (4): 413–439. CiteSeerX 10.1.1.202.2274. doi:10.2307/3343240. JSTOR 3343240. ^ a b Reinarman C, Nunberg H, Lanthier F, Heddleston T (2011). "Who are medical marijuana patients? Population characteristics from nine California assessment clinics". Journal of Psychoactive Drugs (Review). 43 (2): 128–35. doi:10.1080/02791072.2011.587700. PMID 21858958. ^ Abuhasira R, Shbiro L, Landschaft Y (March 2018). "Medical use of cannabis and cannabinoids containing products - Regulations in Europe and North America". European Journal of Internal Medicine. 49: 2–6. doi:10.1016/j.ejim.2018.01.001. PMID 29329891. This page was last edited on 20 April 2019, at 15:13 (UTC).